In June, the navies of India and Australia will hold their first-ever bilateral military exercise off the coast of Western Australia. The exercise will be second overall bilateral naval drill between the two countries, following in the footsteps of the first-ever Australia-India Exercise (AUSINDEX) in 2015. That exercise took place in the Bay of Bengal. “We see these as natural extensions of the current security relationship with India,” Harinder Sidhu, the Australian high commissioner, told reporters earlier this week. “We have very strong strategic and security partnerships.” Since AUSINDEX in 2015, Indian Navy vessels have visited Australia for port calls, but not for exercises. Neither the Australian nor the Indian navies have clarified any operational focus for the upcoming exercise. In the meantime, Australia and India have carried out other major bilateral military exercises, including a special forces exercise in October 2016. Additionally, the two countries are expected to hold their first bilateral army-to-army exercises in 2018. The exercises highlight continuing bilateral convergence between New Delhi and Canberra. 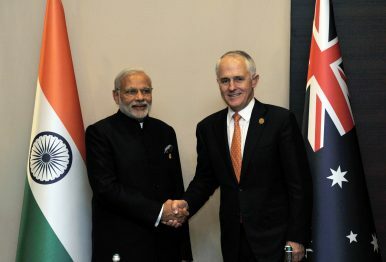 Their confirmation follows in the wake of an April visit by Australian Prime Minister Malcolm Turnbull to New Delhi, where he met with his Indian counterpart Narendra Modi and other senior officials. Cooperation between New Delhi and Canberra goes back years; as the Modi-Turnbull statement noted in April, the two countries profess a “commitment to strengthening the international rules-based system.” Under the previous U.S. administration, both countries had been courted as members of what former U.S. Secretary of Defense Ashton Carter described as a “principled security network” — a network of U.S. allies and partners invested in the status quo regional architecture. More recently, however, the Australia-India security relationship has seen a degree of friction. Earlier this year, New Delhi expressed its discomfort with Canberra’s participation in the now-trilateral Malabar exercises. Originally a U.S.-India bilateral drill, New Delhi and Washington agreed to formally trilateralize the exercise, with Japan’s Maritime Self Defense Force becoming a regular participant in late-2015. Australia notably participated in the 2007 iteration of the exercise, which involved six countries and drew sharp reactions from China, which sensed that the drill was a precursor to a concert of democracies coming together with the goal of containing China. Delhi’s reservations over Australian participation in the 2017 iteration of the exercise reportedly also have to do with Chinese perceptions. For now, India and Australia will likely keep their defense relationship in good stead by keeping things bilateral, but Canberra clearly wants to accelerate trilateral and quadrilateral security cooperation. With the United States somewhat adrift in the Asia-Pacific under a new administration, the urgency will likely persist into 2018.